Caring for Carleigh is a beautiful blog written by Carleigh's mother Holly Haas. It is a blog of stories and photos honoring Carleigh's story, as well as helpful resources for those dealing with an anencephaly diagnosis and infant loss. In this interview Holly shares her journey with Carleigh and grieving her loss. First tell us about your blog, Caring for Carleigh—why you started writing and how it has developed. Before Carleigh's fatal diagnosis, I had never even thought of blogging. After we got the devastating news I decided to start Caring for Carleigh to have a central place to keep everyone updated instead of updating on several websites. As I continued to blog I realized that my writings could help someone who was facing the same thing, just as those who shared their stories helped me. I've had many people thank me for sharing my story because it helped them and that makes me so very glad that I decided to do it. But I think what is most important now is I have a place where our journey and Carleigh's life is documented. It's a place she'll always be remembered. 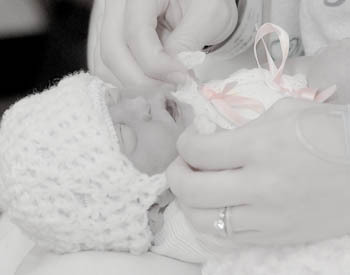 I have a page on Caring for Carleigh that tells more about anencephaly: What is Anencephaly? Anencephaly is one of the most common neural tube defects, occurring in about 1 out of every 1000 births. It is also the most severe form and is always fatal. It occurs when one end of the neural tube fails to close early in pregnancy and results in portions of the brain, skull, and scalp to be missing. There is no known cause for anencephaly and there is no cure or treatment. A study that is taking place at Duke University is study the environmental and genetic factors that could play a part in this condition. My husband and I took part in this study and we really hope that by us and many others helping that we can find some answers. Folic acid is known to help prevent all NTDs so it's important for woman to be taking enough. However, even women who have been on enough folic acid have had children with this condition, including myself. Most sources and doctors will say that babies born with this condition are blind, deaf, unconscious, and unable to feel pain. If you talk to families who have carried their babies to term (which is only about 5% of those diagnosed) and that were born alive, they will tell you a different story. I, personally, do not belive that our babies don't feel anything or aren't aware. Even in my womb, Carleigh would react to me. What was it like to grieve the loss of a child that was still living within you? The first few days after receiving the diagnosis were tough. We really did take that time to grieve the fact that our daughter wouldn't live and that all the dreams and hopes we had for her wouldn't come true. About 4 days after the diagnosis, we left for a family vacation we had been planning for 3 years. When we left, we left our sorrows behind us and just took the time to enjoy ourselves. That time away was a turning point for us and it was just what we needed. We no longer felt the need to intensely grieve over what we were going to lose but rather we felt the need to cherish what we had been given. However, there were still times while carrying her that it was hard and we cried, but with the help of our Lord we were able to pick ourselves up and keep going. One of the things I didn't like hearing from other people was "I'm sorry for your loss." I was being told this while I was still carrying Carleigh. It didn't seem right to hear these words while my daughter was still alive. I kept thinking, "I haven't lost her yet!" I also understood though that people just didn't really know what to say to us. What were the most helpful ways friends and family supported you in your grief? The most important thing was for people not to question my choice to carry to term and to support it fully because there was no way I was changing my mind. It was nice to receive cards, phone calls, and emails from people telling us they were sorry and that they were thinking and praying for us. We appreciated people who stepped up and wanted to help us. We received many wonderful gifts that we are truly grateful for. It showed us how much both us and our little girl were loved. I am glad that nobody questioned how I wanted to do things even if it seemed a little off the wall because it was important for me to do things my way so that I wouldn't look back and wish I had done something differently. After Carleigh's birth, it meant a lot to see all the people that traveled several hours to come to her visitation and funeral. All the messages, cards, flowers, and donations were appreciated. The most important thing now for us is to have Carleigh remembered. We never want her to be forgotten. So when someone speaks her name or wants to talk about her that means the world to us! In a Caring for Carleigh post you mention co-workers not knowing what to say. What might have been helpful for people to say or do in your experience? My coworkers in the department where I work were fantastic through our whole journey. They really supported me and even collected money so we could get a 3D/4D ultrasound done. Some of them came to one of the visitations we held after her birth. While I was still pregnant with Carleigh some weren't afraid to still talk about her and ask about me. I appreciated that. It was the coworkers outside of the department that didn't really know what to say to me and it made things awkward. It would have been nice to have the acknowledgement of our loss and our daughter instead of seeing that they just wanted to get away. You have done several creative things to help you work through Carleigh’s death—a blog, a tattoo, a bike race, song lyrics, a garden space. How were these helpful for your healing journey? Anything that I do in memory of Carleigh is healing for me. I feel like I am honoring her and continuing her legacy. Carleigh has made such a big impact on my life and I am not the same person I was before this whole journey. I can honestly say I am a better person because of it. She makes me want to help others and helping others has been a sort of therapy for me through all of this. I've used lots of different outlets to channel my creativity in grieving for Carleigh and my quest to remember her. One of the biggest ones was her scrapbooks. Creating books of memories of her with my own two hands gave me great satisfaction. I had to go through every picture and memory to create it and I'm glad I got to do that. I get the sense that our culture doesn’t understand the grief of those who have lost babies. Being just a couple months beyond the one year mark, what is your grief experience like? Our culture does not get it at all and I know that many other people would agree with me. Losing a baby at any stage is devastating but our society tries to minimize the grief. We didn't get years with them and we didn't get to make lots of memories, but that does not lessen the value of their lives to us. People think you can just move on and have another baby and everything will be ok. It doesn't work that way. I will be grieving for my Carleigh for the rest of my life because she will be missing from every part of it. We grieve not only for their lives that have been lost, but also for the dreams we had for them and for the milestones in life that they will never achieve. Mommy won't get to see those first steps or hear those first words. There will be no first day of school. No prom. No graduation. Daddy won't get to walk her down the aisle on her wedding day. We won't get to see the grandchildren we could have had. An entire lifetime we are missing and will always wonder about. Through the grace and strength of God, my husband and I have been able to work through our grief and be truly happy. There are still difficult moments for us. We still cry and long for her. But we do not grieve without hope for we know we will see our daughter again one day in Heaven. There isn't a day that goes by that I don't think of Carleigh. There isn't a day when I don't miss her deeply. I wish very much that our society would just accept us in our grief and not tell us how we should be coping. Is there a right way to handle the death of your baby? No matter what people say, I don't think there is. And you truly have no idea of what it's really like until you've been there. I didn't know until I had to walk my own road and it shocked me to see how as a society we tend to want to sweep grief under the table. We should be reaching out to those who are hurting and giving them comfort, not more pain. Any books you would recommend for people dealing with anencephaly or the death of an infant? There isn't really any books out there about anencephaly. The best resource for parents who are facing this road is to read the stories of parents who have already been there. Reading those stories really helped me. 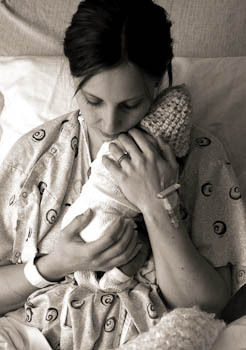 There are also support groups out there for parents who have chosen to carry to term. I found Anencephaly Blessings From Above not long after our diagnosis and this group was so vital for me. It was pretty much the only place I could go where I knew there were people who understood what I was going through. I got so much advice and support there. Three books that I enjoyed about personal journies through loss are In Faithfulness, He Afflicted Me by Lynnette Kraft, Waiting with Gabriel by Amy Kuebelbeck, and I Will Carry You by Angie Smith. Two books I've read that are similar and are good about baby loss in general are I'll Hold You In Heaven by Jack Hayford and Safe in the Arms of God by John MacArthur. Thanks so much Holly for sharing your story with us and your beautiful work on Caring for Carleigh. Return from Caring for Carleigh to read other bereavement interviews.